Sometimes artist portfolios can only contain a couple of comic based pieces, other times there one work can be so brilliant, you'd risk being stoned to death by fellow art lovers for putting something else beside it. These are Random Works of Wow, and illustrating the point this week is artist Amanda Visell with the Justice League. 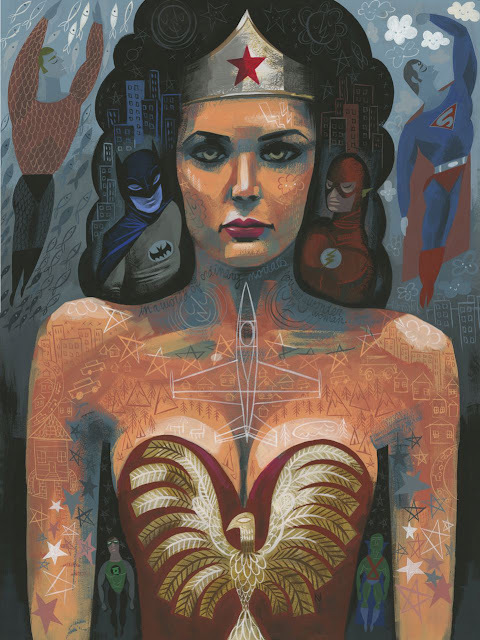 'In a world of ordinary mortals, you are a wonder woman' may be inscribed into this artwork, but there is nothing ordinary about it's result! Highlighting Diana's role within the League and even super-heroes in general, this is a high-class, high-art take on the world's greatest super-heroes! For so many, Lynda Carter defined DC's #1 heroine and that resemblance rightly continues here. Remember to click to enlarge to see all the star-studded detail! What do you think? Sound off below or to view more of Amanda's 'Wow!' inducing gallery, click the jump. Glad you liked it Pensol - me too!